WARN bumpers are designed for double duty: protect your UTV and enhance its appearance. 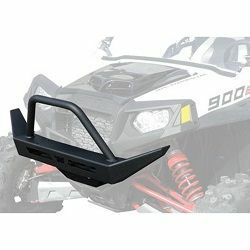 Made of laser-cut steel and powder coated to resist corrosion, our bumpers provide extra defense against trail hazards and are contoured to give your rig a bold, customized look. They're also fully-compatible with WARN winches, winch mounting systems and plow systems. Designed for the extra weight of a Side x Side, and made with premium parts.